Regular Care of hardwood floors is essential to maintaining the beauty of your new hardwood floor. You should always follow the recommended specifications as set forth by the individual floor covering manufacturer. After we complete the installation of your new hardwood floor, our friendly staff can easily provide this helpful information to you. SWEEPING : Brooms with fine, exploded ends trap dust and grit very effectively and may be purchased at most leading home improvement and grocery stores. Use of a bristle type mat at each exterior door entry will collect the larger pieces of grit or small stones that may damage your new hardwood floor. That means less daily cleanup. VACUUM : Upright vacuums, stick brooms, and canister vacuums are the surest way to get rid of all the dirt and dust from your hardwood floors. Be sure to use the special bare floor attachments included with most models. DUST MOP : Use a good quality dust mop that has a 12″” to 18″” cotton head and a special dust mop treatment. Spray the treatment onto the mop head 12 to 24 hours before dust mopping, and it will be ready to remove dust, dirt and grime. With the increase of new home construction in recent years, industry figures indicate that hardwood floors are usually oak and maple wood, and are the most popular hardwood floors being used in flooring. These top sellers are followed closely by ash, beech, birch, cherry, hickory and walnut wood. 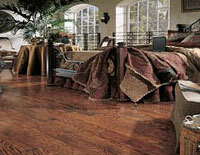 Other types of exotic hardwoods may be considered for decorative accents and designs. Keith Clay has been in business for over 30 years serving Dallas, Frisco, Plano, Richardson and all Dallas Metroplex suburbs. We know wood floors and can answer any questions you may have. If you want the best job from a company of professionals, call us today. 972-463-6604. World Class Craftsmanship. Reasonable Prices.